From Queen of Tarts to the nation's heart, Mary Berry shares her Recipe for Life. From the moment she came into the world - two weeks early, throwing her parents' lives into disarray - Mary has gracefully but firmly done things her own way. Born in 1935, in the city of Bath, Mary's childhood was a curious mix of idyllic picnics and ramblings, and alarming air raids; of a spirited and outdoorsy home life and a dreaded school existence. All nearly cut horribly short by an almost fatal bout of polio when she was thirteen, which isolated Mary in hospital, away from beloved family and friends for months. Recovery saw her turn to her one true passion - cookery. And so began a love affair that has - so far - spanned six remarkable decades; from demonstrating ovens in the early 1950s to producing glossy food magazines in the 60s and 70s, gradually becoming the country's most prolific and - many would say - best loved cookery writer. Until her emergence in the 21st century as a TV sensation and style icon on the Great British Bake Off. As a working mother, at the heart of a busy household, Mary became an expert at the art of juggling, even bringing her working life into her home with her Aga school. And there have been challenges, one terrible tragedy and many joys along the way. In this touching, evocative and fascinating memoir, we accompany Mary on her journey of nearly eighty years; a life lived to the full, with a wicked sense of fun and an eye for the absurd, it is the life of a delightfully traditional but thoroughly modern woman. Fans of The Great British Bake Off can't wait to get their hands on Mary Berry's Recipe for Life. Born in 1935, Mary has been teaching Britain how to cook for over half a century. Her far-reaching culinary career has taken her from recipe tester, cookery editor, author and entrepreneur to TV personality. Mary lives in Buckinghamshire with her husband Paul. 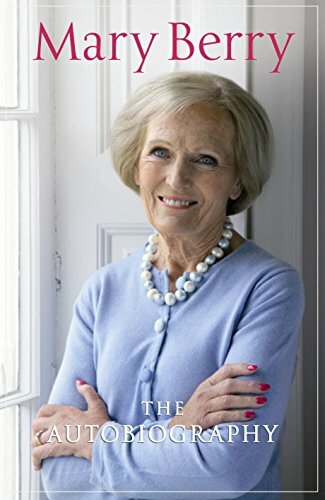 Mary Berry is the nation's favourite baker and author of over 70 books. She was the much-loved judge on BBC TV Show The Great British Bake Off and has been teaching the nation to cook on TV and in her books for over four decades. Cordon Bleu trained in Paris, Mary began her career as a magazine cookery editor before publishing her first cookery book in 1966. In 2009, Mary was awarded the highly coveted Guild of Food Writers Lifetime Achievement Award and in 2012 she was made a CBE in the Queen's Birthday Honours list.